Orkneyinga Silversmiths are Kevin and Liz Allen. 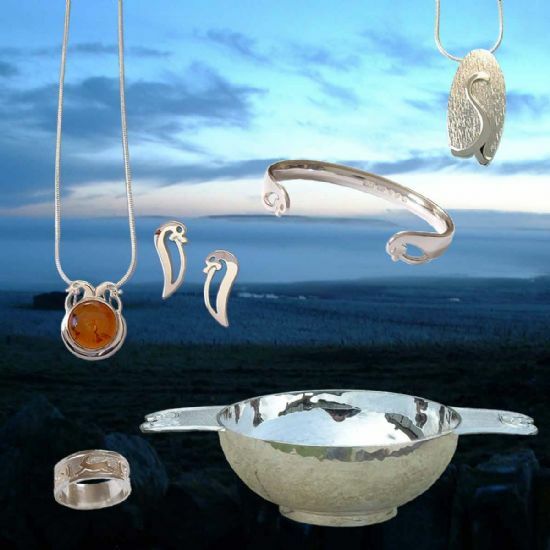 We started working together 28 years ago, designing and making silverware and jewellery in our Orkney Workshop. Kevin started his mastercraftsman's training at the age of 16, when he was apprenticed to a Sheffield Silversmith, and Liz graduated from Sheffield Art College after studying Silversmithing and Jewellery. We aim to bring you the best in design and craftsmanship on a personal level, influenced by the Orkney landscape, its history and its wildlife. You can see that these are exceptional handmade pieces, you won't find them on every High Street! Click on the menu buttons to see more pictures of our work. This website is under construction and more images are being added as we get them.